Approximately 200 people attended a “Standing Together” gathering on January 24, 2016 from 2:00pm – 3:30pm at the Slover Library. The program featured a clergy press conference and interfaith panel discussion. Imam Vernon M. Fareed of Masjid William Salaam (Norfolk) is available to speak to groups interested in learning more about Islam. Imam Fareed is a former VCIC Humanitarian Award recipient, State Board member, and Tidewater Chapter member. 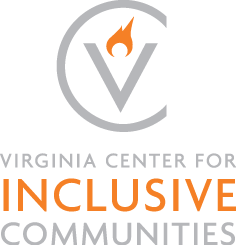 Contact the Virginia Center for Inclusive Communities to be placed in touch with Imam Fareed. Download the poster template (11×17 version or 8.5×11 version) or contact the Virginia Center for Inclusive Communities to get a poster. You can then print the template, write down how you will stand together, and take a picture of yourself holding the sign. Together, let’s show the world that we are all #StandingTogether. Senator Mark Warner convened a small group of religious and organizational leaders on December 11, 2015 at the First Freedom Center, the site where the Virginia General Assembly passed the Virginia Statute for Religious Freedom in 1786. Virginia Center for Inclusive Communities President & CEO Jonathan C. Zur was among the invited participants. 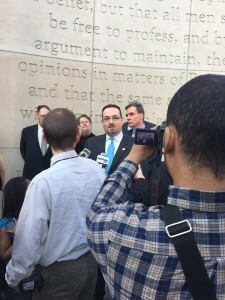 Following a private meeting with the Senator to discuss Islamophobia and ways to improve interfaith relations, a press conference was held with comments from each participant.